Our homestead was a long way from a doctor. The nearest doctors and hospital were in Jasper, Alberta. In the early days, the only way to reach them was to take the CNR train. Not necessarily the passenger, either. In those days there were local station agents. In case of a medical emergency they’d contact the dispatcher and ask that the next train stop to pick up the patient. I’ve ridden to Jasper in the swaying caboose of a CNR freight train on my way to Seton Hospital. Even when roads were built and people could drive to the McBride Hospital, which was closer, going to the doctor wasn’t done lightly. 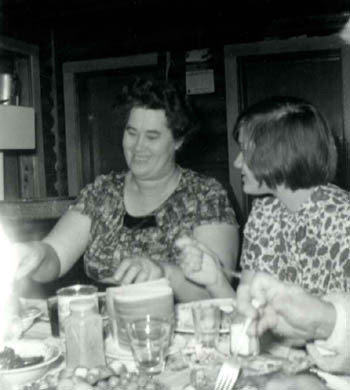 Since my parents had more berries than ready cash, they paid in produce and the order of nuns who ran Seton Hospital were probably pleased to add food to the table for both patients and Sisters. Of course, deciding when to go, what could be treated at home or what was important enough to be seen by a doctor was a tricky matter. In our house it was usually decided, if I recall correctly, by our Mother, who always radiated calm confidence. It cannot have been easy. The time I stepped on a shingle lying in the yard, with a rusty spike sticking up and watched in horror as the spike came through my shoe and out through the top of my foot, I did what any kid would do. I stood still and screamed, “Mom!” Out she came, pried the shingle off, helped me into the house, removed shoe and sock, put my foot in a basin of hot water and Epsom salts. After a thorough soaking, with the hot water renewed several times, she advised me I could go outside and play. I was disappointed. I thought a spike through the foot deserved a little more fuss. When my youngest brother fell off the scaffolding for our new house and was unconscious, Mother’s first thought was ‘Concussion?’. She waited patiently to see how he did. He revived, seemingly undamaged and went back outside to ride his bike. Years later when I was a mother myself, I asked her “Weren’t you worried?” “Of course I was worried. But, I couldn’t let you kids know that.” People living far from doctors did the best they could. Mother had a good teacher in her own mother. 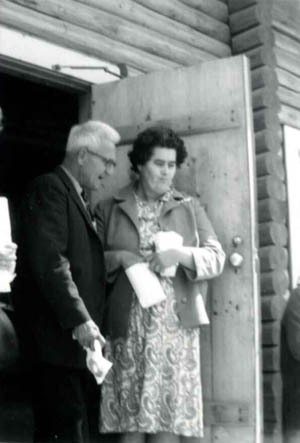 Grandma, a young farm wife in Beausejour, Manitoba, was widowed when the oldest of her twelve children, Uncle Paul, was sixteen. She and the older children rallied round to run the farm. One of the girls died as a child of scarlet fever. But Grandma raised eleven healthy children on that farm. Many of her home remedies were passed on to them. Several times a year jars of ‘goose grease’ arrived at our home from Grandma on the farm. We were always glad to get them. It never occurred to us to ask how many geese it took to fill one jar with grease or how it was rendered. We just knew that, in case of severe chest colds, that grease would be heated and spread over our chests and back. It felt good and there were absolutely no side effects. It wasn’t the only treatment of course. There were the commercial salves and ointments. Vick’s Vaporub, either a dab under a congested nose, or in a steaming pot of water to loosen the cough. The smell of camphor in Watkins products still transports me back to my bedroom in our log house, where I tried to read between coughs. If a cold was particularly severe, Mother brought out extreme measures; mustard plasters. “No point in making a wimpy mustard plaster.”, was her motto. Her mustard plasters were so hot they could melt glaciers. Our bodies began to rebel as soon as we smelled the mustard and flour cooking on the stove. No amount of insisting we were better, really we were, ever prevailed. Only when the skin to which they were applied turned a bright pink, did Mother decide the plaster had done its work. For now. Most of this nursing was Mother’s work. Father excelled at taking out slivers. So he thought. In fact, his approach, using the largest needle he could find, probably a darning needle, sterilized and ready to probe, meant that having him take out a sliver was akin to minor surgery. We tried hard to conceal any slivers from him but he had an eagle eye, able to detect the most minute of wooden intruders and his firm grip on the afflicted body part meant that we might as well resign ourselves. Both Mother and Father agreed on one medicine; a tot of brandy well mixed with hot water and sugar, for soothing and relaxing the sick. It was considered a cure-all for almost any ailment. We weren’t the only family to keep a bottle of brandy for medicinal purposes, the only time it was used. Certainly no one drank it for pleasure. Linda, the youngest in our family, got so that she hated it. She tried to give it to the dogs but they would have nothing to do with it. Finally she poured it into the house plants. Mother’s many house plants were always vigorous and thriving. Coincidence? Cod liver oil was another stand-by. There were two types, regular and orange flavoured. The orange flavoured tasted better, for a few seconds after it was swallowed. Then the orange vanished; replaced by a strong, gag-inducing taste of cod. We decided we’d just as soon have our daily tablespoon of straight regular oil; it was less surprise to the taste buds. Mother, assuming that what was good for kids was also good for cats, insisted on giving Peter, our Persian tom-cat, his daily dose of cod-liver oil during the winter months. Peter took his from an eye-dropper rather than a tablespoon, but down it went. Even he knew better than to argue with Mother. There’s a medical clinic well staffed with doctors in our home town now. Twice a week a medical bus takes patients who need specialists or hospital tests to Prince George and Kamloops. There’s even an ambulance. Those are all good things. Lately I found myself wondering about Grandma’s remedies. After two weeks of laryngitis, whispering “I can’t talk!” as loudly as I can whisper, I recalled that, when we cleaned out the house after Mother died, I found a jar of goose grease. My doctor tells me that laryngitis is caused by a virus. There’s no real treatment for it. Maybe a rub down with hot goose grease might help?